I'm not alone in having little personal love for Julian Assange. That said, I decry any efforts by the U.S. or any government to persecute the publisher for his work with WikiLeaks. 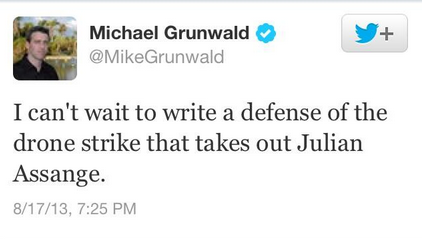 Michael Grunwald posted an offensive tweet from his personal Twitter account that is in no way representative of TIME's views. He regrets having tweeted it, and he removed it from his feed.